There’s always that band everyone knows, but sometimes doesn’t recognize by name. You hear a song on the radio in the car, you crank it up to 11 and sing along, but all you know is the song. You have no idea who sings it or when it’s from—all you know is that it gets the toes tapping. Today’s band kind of falls into that category. Certainly recognized for a few popular tracks, but has SO many hits that many people don’t always give the band their proper credit. Originally based out of San Francisco, today’s band didn’t have high aspirations. They were called the Golden Gate Rhythm Section and were initially established solely to be a backup band for popular Bay Area artists. Made up of members from other established bands that came and went frequently, they struggled to find a groove. After an unsuccessful radio contest to name the group, a roadie suggested the name “Journey.” Everyone approved, the band started touring, but three albums later the fame and fortune hadn’t come. In late 1977 they decided to go a new direction vocally, hiring Steve Perry to take over. The manager also hired a new record producer to add a more layered sound, similar to what Queen was doing at that time. The new path was set, and it was time to roll the dice. We are looking at Journey’s fourth studio album today, Infinity which was released in January of 1978. Perry’s vocals instantly turned them into a band with a more mainstream sound. It would be certified platinum quickly, and would go on to sell over 4 million copies worldwide, making it the second best-selling Journey record to date. Critics cited the use of the stacked harmonies brought on by the new producer as the signature sound for the band. You can really hear on a couple tracks (“Anytime” especially) how three members singing the harmony sound like an entire choir – created a very unique sound. Radio stations were going crazy over the new look and you’d often hear multiple Journey songs back-to-back on larger stations across the U.S.
Everyone knows “Don’t Stop Believin,” which is almost a signature for the band. It ended up being the most popular download in the 2000s that wasn’t written in the 21st century. But when you put Infinity on, you hear at least half a dozen songs you’ve heard before, of which, you might not have identified as being Journey tracks. Unquestionably a very upbeat and catchy album, I can see this being extremely poppy when it debuted, and probably heard everywhere. I’m not sure anyone is going to argue it belongs in the top 10 of all time by any means, but it’s a great listen. A really nice blend of rock, pop and that little something extra, which I believe was unique to Journey during that time. I can’t imagine anyone would put this on today and be dissatisfied. It’s a really easy album to put on and roll through your tasks of the day. 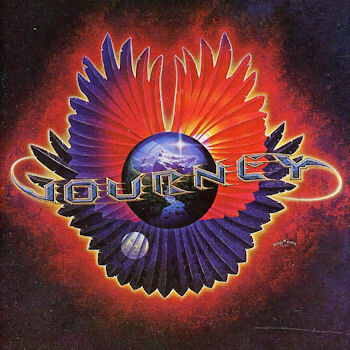 I’m not the leader of the Journey fan club by any means, but this is a can’t-miss record for five bucks.